It is with some trepidation I share a very personal blog post I wrote two years ago on March 10th, the second anniversary of my mother's death. Four years ago today it was the evening before her funeral, and the beginning of a long personal journey for me, one that led me to write this blog, and eventually to a very new life. I share it today with you because over the past two years I have come to see the readers of this blog - and those who share my community - as my family, and so I reprise it here with the hope that it will help you know a bit more about the person behind these words. Two years ago today my mother died. Those last three words seem a bit surreal even now, and it was quite certainly surreal then. When I thought about this blog post I knew I wanted to write it but found ways to avoid it all morning. I knew what I wanted to say but wasn't sure I would find the words, so all I can do is try. I hope I do this story justice. When I decided to blog about today's anniversary I realized there were many things I could write about. I could write about the phone call from my sister telling me there had been an "incident" with my mother - "incident" now being a word that has forever taken on sinister connotations for me. I could write about being told it was time to come home as her survival was unlikely. I could write about the airplane flights that passed as if in a nightmare. I could write about the men on the airplane who, when I rushed past them, made some comment about my obviously being important to be in such a hurry, and my vitriolic response of "My mother is dying - is that reason enough to hurry for you? ", and rushing off the plane with tears in my eyes to beg for the last standby seat on my connecting flight. I could write about those days and nights in the ICU, the most terrifying place in the hospital, where you meet other families, some who will take their loved ones home and some who will never see them alive again. I could write about the decision to end life support. I could write about holding your mother's hand as she dies. I decided, though, that while all those things deserve to be written about that I wouldn't write about them today. Rather, I would write about my mother, and me. In the photo above I would guess I am about 3 or 4, which makes my mother about the same age as I am now. I was her last child, born to her late in life. I have been called by others an accident, but never by her. She always called me a surprise, and one of the very best. She and I were very close, and I suppose some of that is because I was her last child, and the one who remained home after the others had left the nest. She had not had an easy life. She lost both her parents prematurely, and felt very responsible for her younger siblings as a result. She had lived through poverty and grief, and likely more bad times than good. She had five children and I know at times it must have been a struggle, especially when my four eldest sisters were all little and she was often home alone as my father tended to the farm. She was the quintessential stay-at-home mom. I remember when all my friends discovered that I had a mom who baked her own bread, buns, and cinnamon buns. They quickly learned her daily schedule and it seemed that every week on baking day they would suggest that day to study at my house, knowing they would be fed. In fact after she died I received notes from friends, some whom I hadn't heard from in years, expressing their sympathy and telling me they would always remember how kind she was to them and how she always fed them. I recall her feeding all my boyfriends, including some who showed up when I wasn't home. There were a couple of times when I asked her to stop that as I suspected that men are like cats in that if you keep feeding them they keep coming back, and I was trying to dissuade those particular boys from returning. Most of my friends liked to hang out at my house because my mom was home. 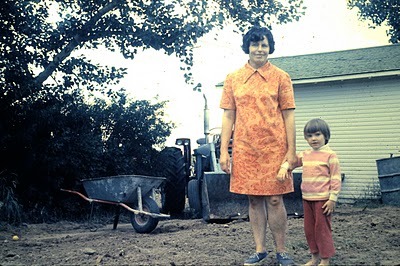 Many of their parents worked, but my mom was a comforting presence in their lives, and in mine. I will admit she may not have been the most educated woman on the planet but she had common sense paired with a huge and loving heart. Those things make up for a lack of education in my opinion, and I suspect my friends felt the same. I don't want to make it sound like she was perfect. Throughout her life my mother struggled with mental illness. For those who think that I shouldn't reveal such things publicly all I can say is that I believe the reason the stigma about mental illness remains is because we refuse to acknowledge it, and only by shedding light on it can we address it. I suspect the stigma is the reason my mother avoided treatment for her problems. The thing is, though, I didn't love her despite her mental illness - in some ways as I grew older I loved her more because of it. Even as a child I recognized that at times she needed someone to be her logic and reason when she could find none, and I decided I would be that for her. I also became fiercely protective of her, knowing that at times she was too fragile to cope with the world. Most of all my mother loved her children unconditionally, without reservation or apology. She loved me when I did well, and when I failed. She loved me through good decisions, bad decisions, and decisions that frankly now make me shake my head. She loved me when I was good to her, and when I was cruel. She loved me every moment of every day of her life, and I never doubted that. And I loved her that way in return. I still do. She gave me the most tremendous gift - not just life, but a life knowing I was loved, and being able to love that way in return. After my mother died the funeral home called and said that even though we had requested a closed casket any family members who wished to see her prior to the funeral could do so. I don't know which of my sisters went - we've never really discussed it as that was an intensely personal decision. I decided to go see her one final time. Now I share with all of you something I have never told anyone but some very close friends. When I went to see my mother I brought her something. I slipped an envelope behind her pillow as I said good-bye. The envelope contained a short letter I wrote that day. I told her how much I loved her, and how much I would miss her. I told her how much I would miss knowing that there was one person in the world who loved me unconditionally and with the kind of love only a mother knows. And finally, I thanked her. I thanked her for giving me the greatest gift of all - teaching me how to be the kind of mother who loves their child without condition, reservation, or apology. That, my friends, is what she gave me - the ability to love my daughter in the same way she loved me. My world tilted on it's axis two years ago, and in some ways it has never been the same. I miss my mother every day, and love her as intensely now as I ever did. What I also do every day, though, is love my daughter as intensely as she loved me. I hope some day my daughter can say she loved me not despite but also because of my faults. I hope some day she finds strength in knowing that her mother always loved her without condition, and without reservation. I hope some day when I am gone that she can let me go but also carry me with her every day, just as I carry my mother with me. Mom, this is for you. I love you.